This is one of my daughters favourite dishes. She absolutely loves it. Recently she got me to make it, but I picked up the wrong recipe and it was not very nice, so this time I made sure I made it using the right recipe. The cheese and spinach filling is lovely. Once the pasta shells are cooked my daughter will stuff a few of them with the cheese filling and eat them before they even go into the oven. I must admit I have one to. So although the recipe says 20 shells I cook about 25-30 shells so my daughter can sneak in a few, and also because some shells can tear, so it is better to have a few extra in case they tear. They will tear if overcooked, so be careful to cook it until it is just al dente. As for the pasta sauce use whichever tomato based one you love. With the ricotta cheese, buy a fresh one, not the supermarket smooth tubs, I really don't like them. I buy my ricotta fresh from my deli, fresh is so much better. This is really easy to make and quite fast to make. 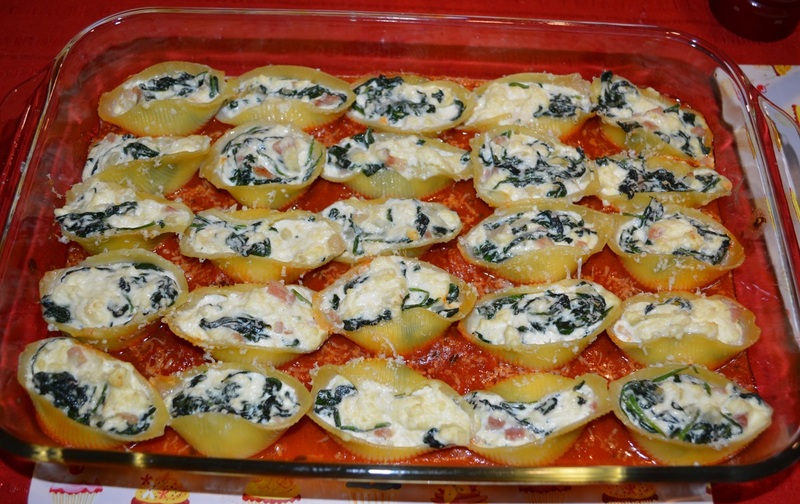 It makes quite a few so would be good at parties, you can prepare the cheese filled shells earlier and refrigerate them covered until needed, bake for 45 minutes if you do this. 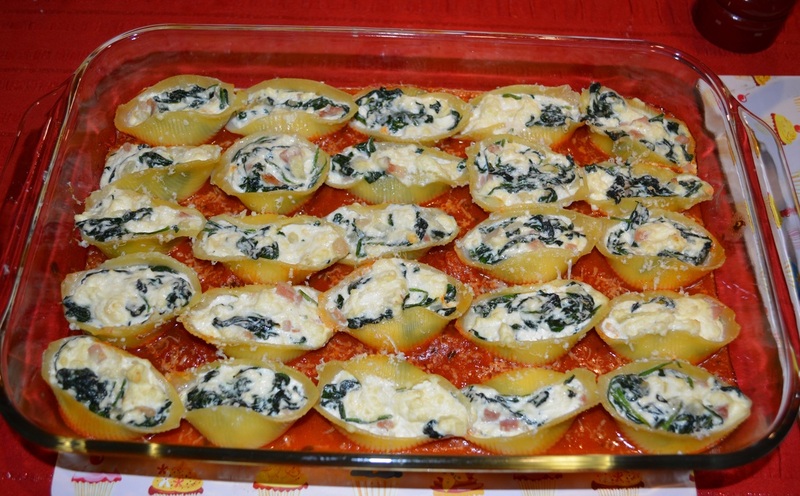 I only make 20 shells as that is what my dish allows, but you could easily get 30 shells with the filling. What I do with the leftover filling is I make Spinach and Ricotta filled triangles using puff pastry (or filo pastry) the next day as a snack for my kids. Just cut out the pastry in whatever shape you like squares, triangles, circles etc. and fill the centre with a little of the mixture, fold over the pastry (or put another piece of pastry on top) and use a fork to seal the pastry opening together. Bake in a 200C oven until golden and puffed. Add conchiglie, one by one to a large pan of rapidly boiling water and cook until just tender. Keep stirring the shells every now and then to separate the shells, as they can fit inside of each other as they soften. Drain well. And separate them to ensure they don't stick together. Heat oil in a large saucepan, add bacon and onion. Stir over a medium heat for 3 minutes or until lightly browned. Add the spinach, stir until the spinach has wilted. Turn off the heat and add the ricotta cheese, stir until combined. Season with salt and pepper. Pour the pasta sauce into your casserole dish. I then added a quarter of a cup of water to the pasta sauce jar, shook it about (to get all the sauce out of the jar), then poured it into the casserole dish also, as my pasta sauce was quite thick. Give it a quick stir and a light seasoning of salt and pepper. 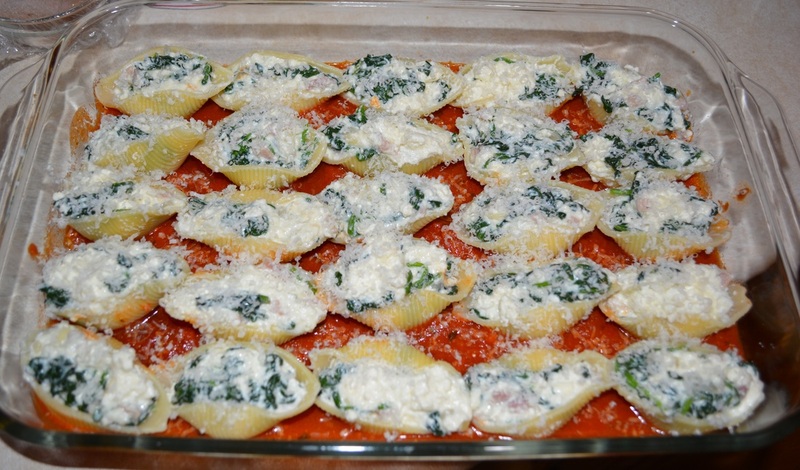 Spoon the cheese mixture into the pasta shells and arrange over the pasta sauce. Sprinkle with the freshly grated parmesan cheese.